As a result I have been encouraging us to pray as a team and to pray with the people in the Opon when we visit them; they have responded very positively. I invite you to join us in crying out to the Lord for help. I will be in El Salvador through December 2nd with my son Andy, visiting our sister community Valle Nuevo. Andy will be there for a month. is my son Andy in the middle and I on the right and on the left is a nephew of Pastor. 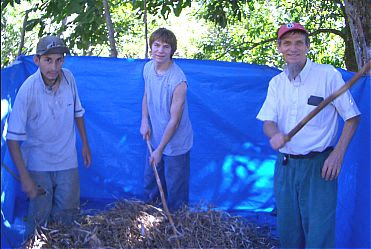 We are hand threshing beans, beating a pile of dried stalks till they are empty of beans.